Are you ready for the best leaf blower on the market? 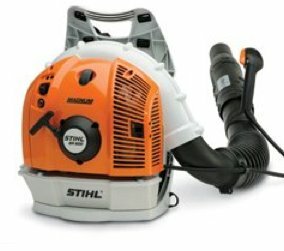 The Stihl Leaf Blower fills the bill, with more models than any other manufacturer. Stihl is synonymous with quality and durability, both for the homeowner and the professional. Since Mr Stihl puts his family name on every one of these products, you know the pride of quality German engineering comes shining through. No other machine around quite measures up to a Stihl, from the detailed styling to the very best engine durability. Each handheld blower comes with a plethora of standard features, o include and adjustable air nozzle, purge pump primer for easy starts without engine flooding, a spark arrestor muffler to keep you from burning the neighborhood down under dry conditions, anti vibration systems, and easy start engines make these machines a winner! Stihl Leaf Blower model BGE 61 is a great little electric blower that produces a whopping 394 CFM air flow at 148 MPH. The weight is more than reasonable at 6.8 lbs, an it is whisper quiet 64 db will keep the neighbors happy. The price is about $100.00. Adding some versatility to the mix is the model BGE 71 electric leaf blower and vacuum. This model has a 2 speed switch, and a conversion kit that allows it to vacuum also. Rumor has it this lightweight fighter works well cleaning out gutters as well as flower beds. It runs about $120.00. Want to throw away the cord altogether on your electric blower? Model BGA 85 is just what the doctor ordered. A lithium ion battery powers this handheld machine, that is able to produce a surprising 385 CFM flow at 102 MPH. Weight is kept reasonable at 10.8 lbs, and run time is up to 20 minutes. Count on spending about $300.00 for this technological marvel. The Stihl Leaf Blower model BG 55 starts the hand held models offered. The two stroke engine is 27.2cc, and is rated at this little pup develops 418 cubic feet per minute (CFM) airflow, with a nice 140 MPH velocity. The noise level is rated at 69 db. Plan on spending about $150.00 for this nice little machine. The Stihl Leaf Blower model BG 56 C-E is very similar to the BG 55. Add an easy start system., a specialized stop switch,and a semi-automatic choke lever combined with a low emission engine, and you have a real winner. The air volume specifications remain the same as the BG 55. Price remains reasonable at about $175.00. If noise is a consideration, the Stihl model BG 66 meets the challenge. Configured the same as the model BG 56 C-E, the BG 66 has a specially designed discharge chute that reduces noise to an impressive 65 db. The price remains about the same as the BG 56 C-E. Prefer a commercial version of the handheld blower? Stihl Model BG 86 is powered by the low emissions engine, coupled with a 4 spring anti vibration system lets you work all day in comfort. Both round and flattened discharge nozzles come standard. Of course the engine has the semi automatic choke lever and throttle lock for easier starts. Air flow is a nice 459 CFM (round ) or 359 CFM (flat) depending on the discharge nozzle shape. Count on spending about $240.00 for this loaded beauty. Now for the backpack blowers. The Stihl leaf blower BR 200 is the lowest priced backpack blower offered, but the features are all-pro. Let’s start with the 27.2cc 2 stroke engine, with double piston rings and anti vibration system. The throttle is tube mounted, and starting this jewel is a snap. Air volume is about 405 CFM, with a velocity of 132 MPH. Weight increases to 12.6 lbs, and the noise rating is 70 db.The price for all this power is a respectable $300.00. Moving up to the model BR 350 increases the engine size to 63.3cc. This is quite a leap, and the performance of this machine reflects that fact. Air displacement is rated at 441 CFM, with a velocity of 168 MPH. Sound rating is 74 db, and the weight is 22 lbs. The throttle is tube mounted once again. Count on spending $370.00. Stihl model BR 430 retains the same 63.3cc engine, but has fewer emissions. The air speed is increased to 183 MPH, with a flow of 500 CFM. Weight remains at 22.3 lbs, and the noise rating is 76 db. An anti vibration system comes standard. The price is $420.00. Model BR 500 is equipped with a larger 64.8cc low emission engine, that produces 181 MPH air velocity with 477 CFM air flow. A special discharge tube lowers the sound to a respectable 65 db. At the top of the Stihl leaf blower mountain lies the model BR 600 magnum. Any resemblance to Tom Selleck is purely coincidental... This baby sports a clean burning engine, a new nozzle design, and easy to adjust blower tubes. The power to weight ratio is impressive also. Alas, the best also costs the most. Plan on spending about $450.00.